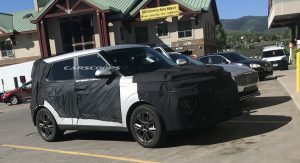 The 2019 Kia Soul has been spotted in Colorado by Carscoops reader Brett Borgard. 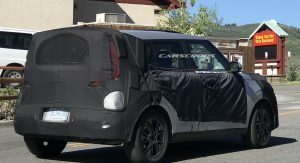 Snapped up close, the images reveal the next-generation Soul will keep its boxy shape and adopt an evolutionary front fascia. 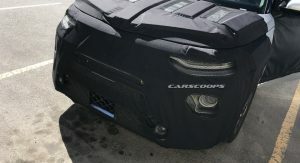 The latter has slender LED daytime running lights up top and large headlights positioned beneath them. 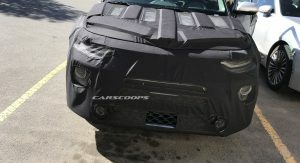 Further down below, there are fog lights which are integrated into the lower air intake. 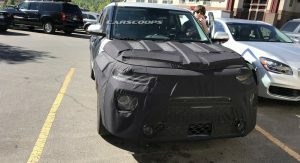 The sides of the Soul are pretty evolutionary as we can see the model will have pronounced wheel arches and a familiar roofline. 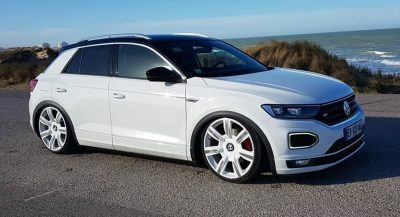 Despite the styling similarities, the redesigned model eschews front fender vents and adopts a revised greenhouse which curves up towards the back of the rear doors. 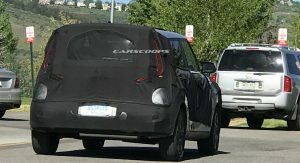 While the rear of the model is heavily disguised, we can see the next-generation Soul while have boomerang-shaped taillights. 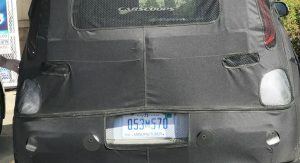 Additional styling details are hard to make out but it appears the tailgate will remain relatively upright. 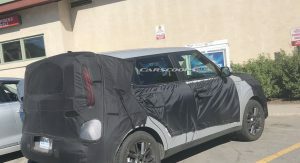 Kia has been tight-lipped about the upcoming model but it is expected to ride on the same platform that underpins the Hyundai Kona. 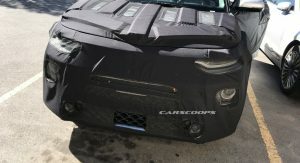 If engine options are shared between the two models, U.S. consumers can expect the base model will have a 2.0-liter four-cylinder engine producing 147 hp (110 kW / 149 PS) and 132 lb-ft (178 Nm) of torque. 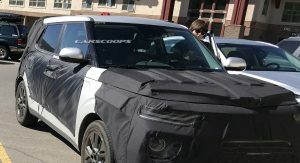 The Soul could also be offered with a turbocharged 1.6-liter engine developing 175 hp (130 kW / 177 PS) and 195 lb-ft (264 Nm) of torque. The most interesting feature that could carryover from the Kona would be the model’s optional all-wheel drive system. 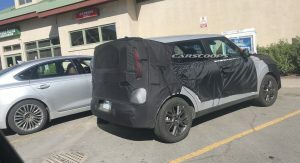 The Soul has always been front-wheel drive but Kia hinted at the possibility of an all-wheel drive variant when they introduced the Trailster concept at the 2015 Chicago Auto Show. 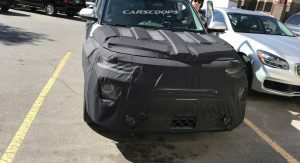 The addition of all-wheel drive would enable the Soul to better complete with compact crossovers such as the Chevrolet Trax, Jeep Renegade, Honda HR-V and Toyota C-HR. 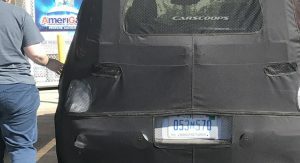 The latter model is available exclusively with front-wheel drive and Toyota has already admitted the decision is “hurting its sales potential” in the United States. Stay tuned for the ‘Hampsters on Skis’ commercial to follow! 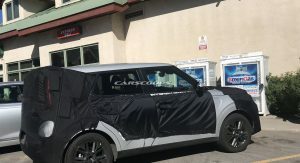 Has the Kia Stonic been cancelled for the US if an AWD Soul is coming? They seem to be about the same size. i read an article once that the Stonic wasn’t for the US. There are no plans for AWD at this time, based on the information available to dealerships. 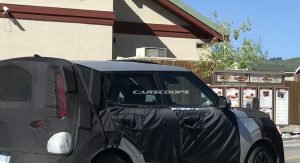 I’m curious how they utilized the corporate grille on this. 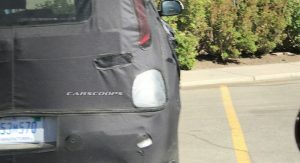 Usually you can see it through spy shots, but it seems pretty well covered. 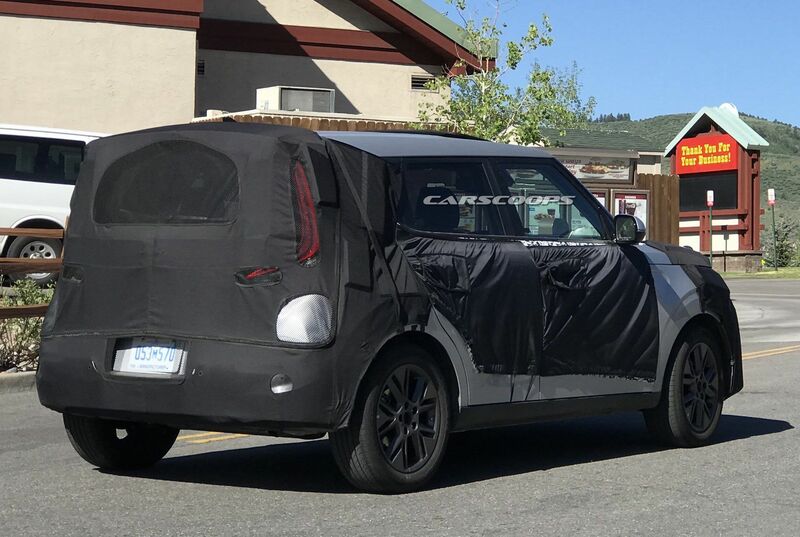 This is the 2020 Soul.